I’m moving to Woodstock on Saturday for 2 (maybe 3) months. 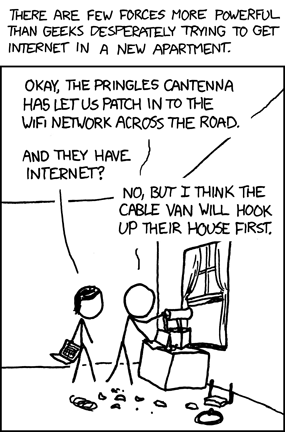 This is this morning’s XKCD. Serendipity is crazy. Although I won’t be using the cantenna that Lourens and I actually did make ourselves — because my 14 dbi panel antenna is a little more reliable. Luckily most of the stuff is just going to stay in boxes until we move into the house in Obs. Thank god for movers & girlfriends! ps. I am looking for a cheap supplier of BNC connectors (male and female)… does anyone have any they want to flog or know of somewhere that sells them at reasonable prices? Speaking of antennas, CTWUG now has a highsite operational in Wynberg both on the 2.4 and 5.8 frequencies.